Bulgaria ranks third in Europe in terms of the number of antiquities lying in its soil. Although known as the Land of Roses, it has experienced many wars and conflicts throughout its history. 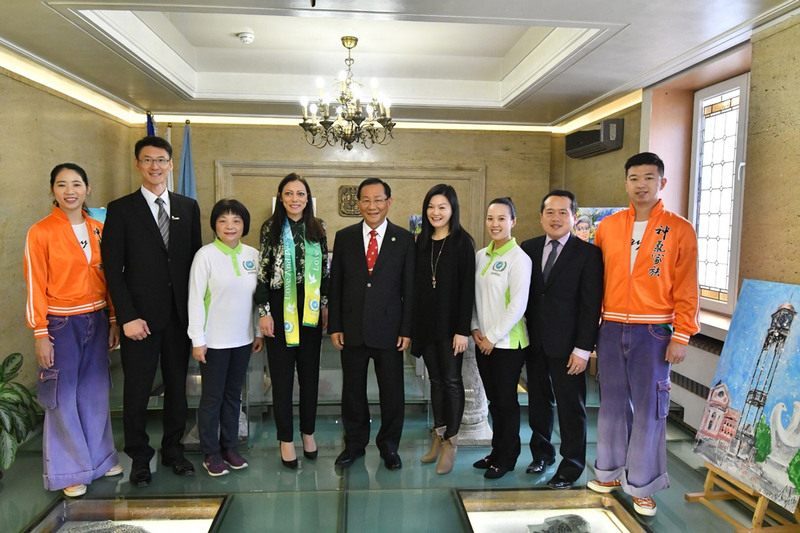 On October 17, Dr. Hong, Tao-Tze, President of the Federation of World Peace and Love (FOWPAL), led the FOWPAL delegation to Bulgaria to conduct cultural exchanges. The FOWPAL delegation visited the capital of Bulgaria--Sofia, which in Ancient Greek means “clever, skillful, intelligent, and wise." 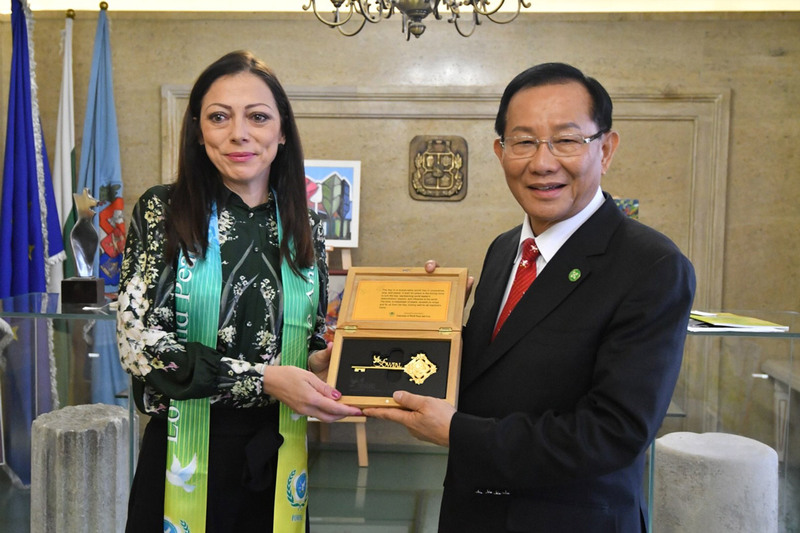 The delegation was received by Head of the International Relation Protocol, Ms. Teodora Tzvetanova, who represents Mayor Yordanka Asenova Fandakova of Sofia. 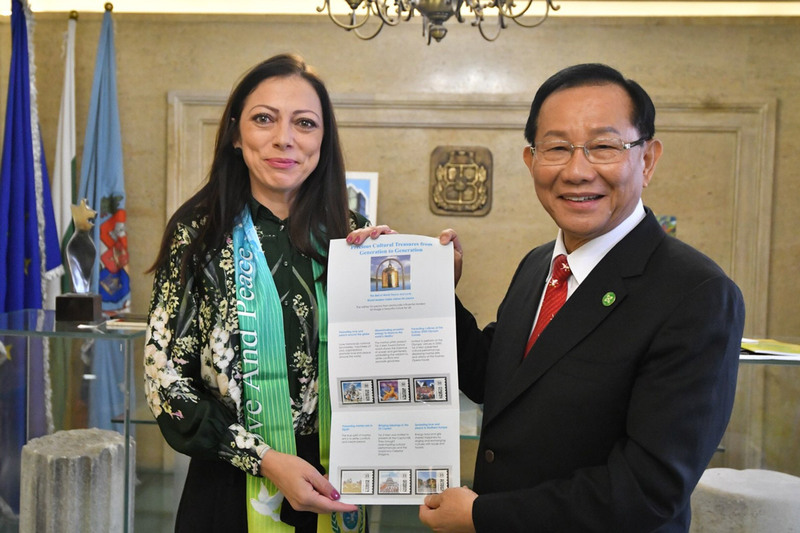 On behalf of the mayor, Ms. Tzvetanova expressed the mayor’s regrets for not being able to meet with the delegation and her best wishes for FOWPAL’s cultural trip of peace. Dr. Hong shared the achievements of FOWPAL in promoting love and peace around the world, including holding the World Leader Summits of Love and Peace at the United Nations headquarters, sharing love and peace with former UN Secretary-General Kofi Annan, and exchanging ideas with H.E. Mr. Ban Ki-moon, former UN Secretary-General, through correspondence. Ms. Tzvetanova and the FOWPAL delegation had a very enjoyable talk. Ms. Tzvetanova said that she had browsed FOWPAL’s website in advance and that she admired FOWPAL's efforts in promoting love and peace. Ms. Tzventanova also mentioned that H.E. Mr. Ban Ki-moon, the then UN Secretary-General, visited Bulgaria a few years ago. “A good culture nurtures quality education, which leads to a sound economy, and a healthy economy is essential to peace,” stressed Dr. Hong. Ms. Tzventanova, on behalf of the mayor, accepted a gift--a symbolic key to the heart--from Dr. Hong. Over the years, FOWPAL has been spreading the message of love and peace worldwide through cultural exchanges, summits, and ceremonies of ringing the Bell of World Peace and Love; its message has resonated with countless people across the planet. Bulgaria is the 88th country that FOWPAL visited. During the trip to Bulgaria, the FOWPAL delegation visited Sofia and other cities, sharing the idea of love and peace with locals. Many people stopped and watched with enthusiasm when FOWPAL volunteers sang a song called “We Are One World.” Despite cultural and language barriers, the peaceful song touched the spectators’ hearts as the FOWPAL members cheerfully interacted with them.